Celebrating a successful first summer of the MEd program. Half a century ago, people believed that learning started at around age 5 or 6. Despite decades of evidence to the contrary, the education system continues to be based on that model, with private sector childcare dominating the pre-kindergarten years. "We now know that birth to age 3 and especially ages 3 to 5 are critically important, yet this entire arena is immensely under funded," says University of Hawai'i at Manoa Professor of Education Stephanie Feeney. "Teachers who work with children during this critically important part of their life cycle can teach with just four courses. An AA is considered a good degree. Preschool teachers? salaries in most settings are about half that of the Hawai?i state Department of Education teachers, yet they are the people laying the foundations for everything else that happens to a child." Feeney and colleagues throughout the UH system and in professional organizations and the private sector are working to standardize core knowledge in early childhood education, develop a career ladder for educators and set salary recommendations--in short, establish the field as a profession. 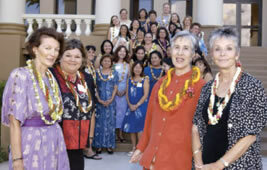 Their efforts took a big step forward during summer 2003, when the first cohort of students entered the University of Hawai'i at Manoa's innovative and interdisciplinary new master's program in early childhood education. The 30 participants from five Hawaiian islands and American Samoa include teachers from a public kindergarten, a Hawaiian immersion preschool and private preschools. But they also include parent and family educators, community college instructors and preschool directors and administrators. The program reflects the realities of work requirements -- participants will spend two more summers in intensive three-week courses at Manoa and the intervening school years in independent and distance learning activities. Shannon Spencer (AA '93 Honolulu; BEd, PD '95 Manoa) attends, sponsored by Kamehameha Schools. She has three young children of her own and eight years of public elementary and Pu'u Kahea Preschool teaching experience on the Wai'anae Coast. Still, she felt she could know more about how young children learn. "I hope to expand my knowledge and skills and apply this knowledge to my own classroom," she says. "I have learned how to read research that applies to early childhood education and how it relates to my own classroom and teaching style. I plan to apply updated information on current trends and issues to my curriculum planning for my students." Spencer is one of the lucky ones who may benefit financially as well -- Kamehameha Schools is addressing salary incentives for advanced degrees for its preschool as well as K-12 teachers. But enthusiasm is high even among students who won't see immediate salary increases. "I tell my students, if this isn't a calling, don?t bother," says Feeney. We looked for people who are leaders, says Professor of Family Resources Dana Davidson. Graduates will be well-equipped to deliver or supervise quality teaching, influence public policy, conduct and analyze research and improve services to children and families. The program was 10 years in the making, in part because its proponents had to convince skeptical university review committees that the degree was as competitive and scholarly as any other graduate program and that early childhood education is a legitimate field separate from elementary education. The indefatigable pair persevered. "This is a crusade for us," Feeney says. They garnered crucial support of two deans--Randy Hitz from the College of Education, which delivers K-12 teacher training, and Andrew Hashimoto from the College of Tropical Agriculture and Human Resources, which houses child development and family majors. The staff of Manoa's Graduate Division provided invaluable advice, and Victor Kobayashi, former dean of Outreach College, contributed his entrepreneurial experience in creating effective summer programs. Co-director Linda McCormick, a professor of special education, lent her expertise on the issues of children with special needs. The National Association for the Education of Young Children considers early childhood to encompass birth to age 8. A strong primary school program resides in the College of Education, which collaborates with CTAHR on an early childhood specialization. So the new UH program concentrates on birth to age 5. It doesn?t limit its view to the educational system, however. "Kids are kids. Kids come in families. You need to look at them in the context of family, community, education," says Feeney. "Culture is a huge part of it," adds Davidson. The political culture could easily breed competitiveness between preschool and K-12 segments both seeking limited public support. Yet Feeney and Davidson delightedly report that their students are learning from each other and beginning to collaborate. The reason, Davidson observes, is simple: "Our students are interested in early childhood education as a profession." Cheryl Ernst is director of creative services in External Affairs and University Relations.